Research shows us that emotional regulation is one of the key factors for the development of resilience and wellbeing. This makes sense when you think about it; being able to understand and manage our emotions, particularly those strong emotions which can hijack and threaten to overwhelm us, can allow us to feel more in control and respond, rather than react, to difficult situations. 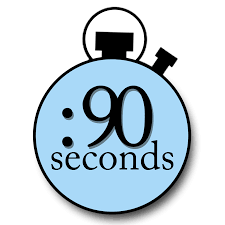 There are many strategies which may help the development of emotional regulation in children, and teaching them about the 90 second rule is one of them. First, it is helpful to understand some of the neuroscience behind emotional regulation. In my experience, children from around the age of eight and upwards really enjoy learning about their brains. I think that it is vital to equip them with this knowledge, as it can build their self-awareness and self-efficacy. We can teach them that intense emotional response is triggered by the amygdala, which is the emotional centre of the brain. When we feel under stress or perceived threat, the amygdala literally hijacks the brain, leaving us without access to that part of the brain which is involved in higher -order reasoning – the pre-frontal cortex. When the amygdala is in control, our impulses take centre stage and we often do and say things we later regret. When discussing this with children, they usually give plenty of examples of when this has happened to them. It’s really helpful if we adults can also share our experiences of ‘amygdala hijack’ – the children will certainly enjoy reminding us of any they witnessed anyway! So, what is the 90 second rule? This comes from the work of Dr. Jill Bolte, a brain scientist who, after suffering a stroke, gained a unique understanding of the inner workings of the brain and mind. Her TED talk and book are well worth a look for more information on her insights. She discovered that when we have a strong emotional response, it only takes 90 seconds for the stress chemicals produced by this response to be flushed out of our systems at a biological level. This is such an empowering fact, as it means that if we allow the strong emotion to surge through us for those ninety seconds without interference, it can pass and we can then respond on a calmer level, from a position of more self-control. On a neurobiological level, these 90 seconds give us time to access the pre-frontal cortex, and choose a more adaptive response. This is easier said than done, as once the emotion takes hold on a physiological level, it is our interferences on the thought level which can perpetuate it. This is where a spiral of automatic negative thoughts can often kick in, and our self-talk becomes destructive and damaging. Our minds can go into overdrive at this point, remembering similar incidents from the past or imagining future implications. The amygdala doesn’t get a chance to become inhibited, and so our higher order brain remains out of reach. If left unchecked, this pattern of response can become habitual, with subsequent damage to so many life domains, including relationships, self-esteem and overall well-being. N: Name the strong emotion. Research has shown that the act of naming an emotion engages the prefrontal cortex, thus allowing higher order thinking processes to become engaged. A: Accept the strong emotion. The emotion has occurred, so there is no point trying to suppress or question it at this point- these actions can engage automatic negative patterns of thought. B: Breathe! By bringing awareness to the breath, the waves of emotion can be surfed and allowed to pass. Keeping attention on the breath also helps to keep negative thought processes at bay. B: Body: Connect to your body as you breathe. Try to feel your breath going right down to your feet! I have found that children readily understand the steps of this strategy, and the four letters are easy to remember, which is vital when in the midst of an intense emotion. Linking it to a lesson on the brain deepens understanding. Having a poster on display as a reminder is also helpful. Of course, that’s not to say that this is an easy process, it takes time and repeated practise. However, I feel it is a powerful self- calming technique which is well worth arming children with. Modelling this response ourselves is probably the most effective way of helping our children to use it – we have to walk the walk, as well as talk the talk! The Weaving Well- Being programme contains more information on this and other positive mental health strategies for children. Bolte Taylor, J. (2006). My Stroke of Insight.